American television personality Tammy Rivera had quite a woeful marriage, but her daughter made sure to keep her the needed company while helping her mend the relationship with her husband. 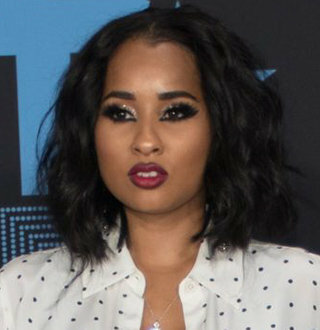 Tammy Rivera is best known for her appearance as a cast member of the VH1 reality show, Love & Hip Hop: Atlanta from the third season. She is also known for her song, All These Kisses. Tammy became a platinum-selling recording artist with the release of All These Kisses in 2017. Born in 1986, Tammy Rivera Williams blows her birthday candles every 30 July. Embracing an American nationality, she shares a mixed ethnicity as her parents come from different ethnics; her mother being an African-American and her father being a Nicaraguan. You May Also Like: Erica Dixon Wiki: Adorable Daughter, Net Worth | Boyfriend At Age 34? Tammy only got to meet her biological father, Oscar Rivera in 2015 as he was serving time in prison for 30 years. She shared a very heartfelt message about her reunion with her father in December 2016 in an Instagram post, hinting on how she was planning to take care of him and maintain a strong relationship with him. The 32-year-old television star joined the cast of Love & Hip Hop: Atlanta in 2014 on its third season, and since then, she has been developing her career paths widely. Tammy launched her swimwear line T-Rivera in 2015 that is geared towards curvy women mostly but features all sizes for women who are taking a fashion-forward approach. It wasn’t long that Tammy made her singing debut in June 2017 with her single, All These Kisses that has gained over 7 million views on YouTube. She soon released another song, Lose in April 2018 that has already achieved more than 600 thousand views to date. According to sources, Tammy Rivera has got an estimated net worth of $200 thousand, that she gained through her multiple career lines. She earned her fortune through her appearance in the Atlanta franchise of Love & Hip Hop and also from her clothing business line, T-Rivera. Tammy also gained some of her wealth from her debut song that sold several copies. Her YouTube channel also brought her some considerable amount of money with the release of her songs. Tammy Forgives Baby Daddy After Scandal; Daughter's Love Sparks Reconciliation? It was in 2014 that Tammy married her rapper husband, Juaquin Malphurs aka Waka Flocka Flame. She wasn’t exactly happily married with her partner as Waka Flocka cheated on her in 2016 and the scandal was so secret. While Tammy didn’t actually opt for a divorce, she did separate from her husband to give herself more time with her daughter, Charlie. The pair were separated, and Tammy was wise enough to provide the baby daddy a chance to prove himself in the relationship and her daughter was one of the integral parts of their reconciliation as well. Although Tammy’s daughter came from her previous relationship, Waka loves Charlie like his own. And this might be the reason that he decided to reconcile with Tammy. During the time of their separation, Waka never missed the opportunity to stay updated on daughter Charlie who's already the age of 13, whether it was just to talk to her or to ask if he could drop her at school. The baby daddy shows so much adoration for Tammy’s daughter that he even made a tattoo of Charlie’s face and Tammy didn’t hold back to show it off on her Instagram, captioning the picture as ‘When he loves your child more than he loves you.. that’s when you know it’s real! Stepfather would be an insult’, clearly showcasing her adoration for her husband. Tammy is more than happy at present with a husband who loves her daughter to an inexplicable extent, and she doesn’t hold back while defending her baby daddy through the media critics. Benjamin Maisani Bio: Post Anderson Cooper Split, Where Is This Bar Owner? Liz Wheeler Age 29 Bio: Proudly Engaged & Married, Who Is Her Husband?